I used to be so good about blogging. I used to be so good about reflection and the observational life. I write. I read. Observation goes with those. I used to have more than enough material for daily posts. For 3 years, there was more than a post a day. Now, I can barely get a post a month. You can be forgiven for feeling that I'm never around. It is the truth. I'm not around. In February of 2013, my office won a very large job, part of the largest road construction project in Illinois, the rebuilding of the circle interchange in Chicago, where Interstate 290 meets Interstates 90 and 94. It was complicated, but it got us into several other projects and work has never ceased. If we aren't out in the field, we are in the office. I used to write several posts from the comfort of my office. Get the work done, write one, two or three posts. Now, I don't have that luxury. I'm heading out in the early morning hours Monday for a full day in the city on yet another large job. I started it last Thursday. There are 30 buildings to inspect. I am not sure if I will do the bulk of them but I will have a lot done by noon on Tuesday. I don't mind the field work, it's the writing up of the reports afterwards that I dislike. I admit to procrastination in that regard. I should be better about writing these. If I didn't drag my feet because I dislike it, then there would be more time for the things I do like. I've seen things, gone places I never would have ventured to. I kind of want to go back to this fabric shop even though I need fabric like I need Bubonic Plague. 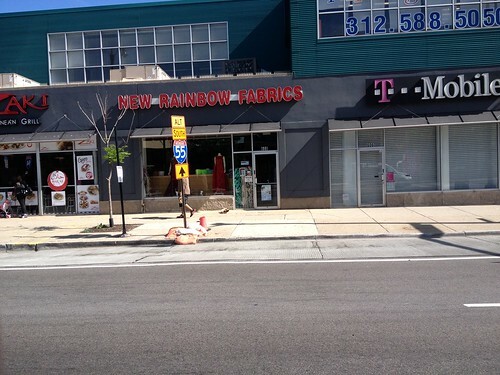 But...fabric! I never would have found this place had I not had to go do an inspection in a section of Chicago where I'd never been before. I'm traveling more than in past years. That alone takes me away from this computer and the pushing of keys and the wrestling of letters into words into sentences into paragraphs. It's sort of good for the pocketbook because we get paid a mileage rate when we have to use our cars. But day trips of 12 hours can wear on one, grind one down, make the recliner or the bed more attractive than telling you about the way cool place I found myself back in May. I haven't blogged about that even though the space was amazing and I should show you some of the photos I took. I made the deck space this year different from previous years. I haven't shown that to you and here it is, half-way through deck season. I'm out there, although not, obviously, right now, writing or reading, cats under the chair or in the doorway. I started journaling, something I used to do ages ago. I bought a package of gel pens and writing in colors has been wonderful for creativity on those pages, not so much for collecting thoughts here. And I'm drawing again. Bits and scraps and thinking I really need to invest in a good pencil sharpener. The journal entries are interspersed with art. Will I post some of it here? I don't know. And there is life, in general. The Jeep finally died. I think I can write about that today although the deck calls. I need to upgrade my computer as World of Warcraft is bracing for a major expansion of play next month and the memory cards sit to my right, still in the box, still waiting for me to make the time to change out what I have for new and shiny. The electric line through the middle of the house, covering the bathroom, the hallway and the office, is non-functional. Next month, I need to have an electrician come out and look at it, tell me what it will cost to fix, and dread that whole process. I look years ahead and think just how much to do I want to invest in this place that's been my home for 30+ years. I had to move the computer to the living room. There are plusses and minuses to this. I found, rather he found me, a landscape/lawn guy. He lives two blocks north of me; went to the same grade and high school Carole did. He's a go getter, if I may be allowed a retro word here. Yes, last year, I spent $250 on a brand spanking new lawn mower that now sits in the shed. If he hadn't wandered into my life when he did, my lawn would not look as good as it does. I have no time and less energy. I haven't blogged about that and I need to show you what I've done. And there is the RA. I honestly don't remember what I was doing when I cut my finger. It was something in early June. Probably planting. I was going to blog about my evolving plants. 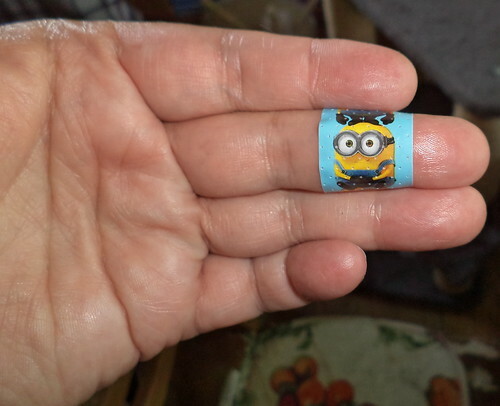 Well, that didn't happen, but there is a minion bandage for that cut. And it's my hands which have given me the most problems this year. My rheumatologist has moved to Atlanta and I see a new lady in August. Spring was, for some reason, particularly trying. There were and are aches in finger joints and in my wrists. That's the only place I seem to be greatly affected. When you spend a whole day typing reports, you don't want to come home and type blog posts, less so if the middle digit on the left hand hurts. and then I crash. It is not uncommon for me to sleep 16 hours on a Sunday after a Saturday of activity. I don't feel fatigued on Saturday. I feel energized and am thrilled with all I can accomplish. Sunday morning dawns and I feed the girls and go back to sleep, getting up for an hour at one and maybe a few hours from 4-8. The RA web sites I follow talk about the fatigue. It is beyond "fatigue" and the associated connotations. It is beyond "exhaustion" and the definition of that word. I collapse, completely, totally. The deck and the sunshine hold no allure. Give me my bed. This breeds frustration. There are dishes in the sink, clothes in the washer, grit on the floors, dust everywhere. I forget my daily vitamins. Don't bother me. I retreat. I seclude myself. I don't go out. Don't ask. It was a big, very big, deal to go to a wedding at the end of last month. It will be a big deal to go to Carole and Larry's. I could, very easily, recuse myself from life and stay in my bed. You don't know fatigue until it's from a chronic illness. "I'm so tired." Please. And this takes me away from the blog, from life, from things which used to give me great pleasure. So, where am I? I am still grateful every single day. I am happy, too, in my own way. My happiness does not depend upon others. It comes from myself and if I can make myself happy in a small way, my whole day is happy. Yet, I look at this space and the hundreds of photos I have taken which have not made their way here and I feel a pang of unhappiness, emptiness, maybe. How to realign my life that I can get back here and yet do those things which are giving me pleasure? That's where I find myself. I promised, some months, or perhaps a year ago, that I would post more. I shouldn't make empty promises. I'm still here. I'm still me. I have joys and sorrows, frustrations and celebrations. I still have two cats, one of whom is in her box, snoring. I am reminded of a quote usually attributed to John Lennon but which was written by Allen Saunders for Reader's Digest. Truth. I love the journey, even with the potholes.